The Zeonic Geofront: How Much would the Deathstar Cost? 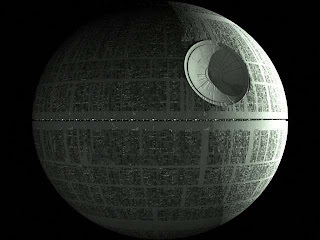 • First, assume that 1/10 of the 17.16 quadrillion cubic meters of the Death Star is something other than empty space and 6/10 of the total volume is pressurized space. • That will require 1.71 quadrillion cubic meters of steel, about 134 quadrillion tonnes. That's $12.95 quintillion in current 2008 prices, and that's without counting strange alloys and elements. • Shipping that to space will cost $95 million per tonne: So add $12.79 Septillion in transport. • Now you need to add air, which will require 8.23 quintillion cubic meters of Nitrogen, and 1.65 quintillion cubic meters of oxygen, for a total delivery cost of $2.81 Septillions and $212.46 quintillion.